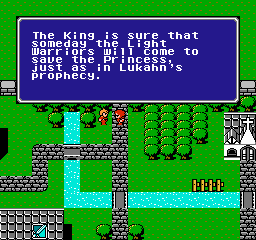 There are many hacks for the first NES Final Fantasy. Some consider two of them to be the definitive versions of the game. 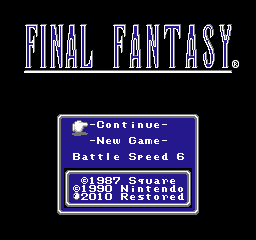 The first is AstralEsper’s Final Fantasy Restored. The next is Grond’s Final Fantasy. The font used, however, is difficult to look at to many. To give people the choice as to which font they’d prefer, this font package was made. 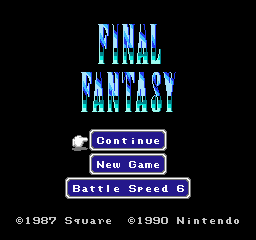 With this, for whichever one is your NES version of Final Fantasy, you have the choice of the original NES font used, the Final Fantasy IV font (USFFII), or the font for Final Fantasy VI (USFFIII). 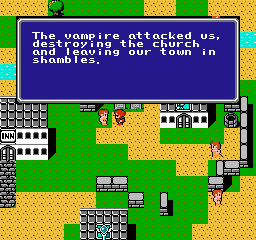 You can also use these fonts on vanilla Final Fantasy (for your own use or for you’re own project). Also if you found the shadow on Restored and Grond’s hacks difficult to see on a CRT, a No Shadow patch is included as well. 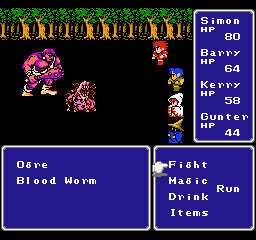 Prepatched with either Final Fantasy Restored or Grond's Final Fantasy.